For the biggest variety of fishing charters Los Suenos is where it's at. With well over 50 boats departing a day from Los Suenos Marina you can easily let us "hook" you up with reliable skilled captains ready to take you out to sea. 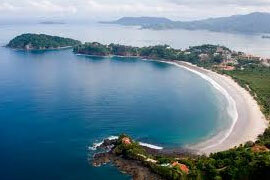 Choose from all over Costa Rica like Marnia Pez Vela or Quepos in the south. Tamarindo, Flamingo, and Papagayo in the north are some of the best places to book for your fishing trip. Regardless of whether you're a fishing pro or a total amateur we have a boat and captain for your budget and skill level. You will not leave Costa Rica with an empty lure! 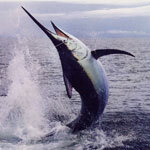 Saltwater fishing is by far the most common type of fishing done here in Costa Rica. It doesn't matter if you're trying to land a massive Sailfish, Dorado, or Blue Marlin they're all here. The fishing never stops in Costa Rica, it's available 12 months a year. In the best months of the year it's not uncommon to get 20 fish in a single day or when the captain is really hot upwards of 30-40. Marlin are the toughest bunch. There's no backtracking when hunting Marlin, if you miss your shot they're gone. Book with us and we'll set you up with the best fishing captains who will surely land you fish after fish and put a smile on your face. Blue Marlin are one of the most common fish to land here in Costa Rica. The best times for them are October, November, and December. Blue Marlin can grow up to fourteen feet and weigh upwards of 2000 pounds. They are one of the best fighters Costa Rica has to offer. The average Blue is near 300 pounds and they live in the Atlantic, Pacific, and Indian ocean. They reside everywhere in Costa Rica but they're most popular in Los Suenos and Quepos. Book through Bachelor Party Bay and you'll get your shot to land yours! 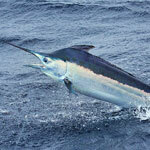 The most popular time to catch Black Marlin is in June, July, and August. Lately though we've been seeing them all year round. The best bait for them is Tuna, Squid, Mackerel, and Mallyhoo or use a Rapala lure. With an average weight of 200 pounds and speeds of up to 65 MPH they aren't easy to reel in, but when you do land one it will surely be a fight you won't forget. Striped are usually smaller and tougher to land then the black and blue marlin. Don't let that trick you though because they are still the fight of a lifetime. Their beautiful blue stripes are caught here in Costa Rica year round. Most heavily found in the Quepos and Golfito area. Sailfish are found all year round so you can't miss them regardless of when you come. November to May are the best times to hit them when you can snag upwards of 12 a day. Not as tough as Marlin, they are still a great fish to fight here on the Costa Rican waters. Sailfish can be 10FT and weigh 200lbs. 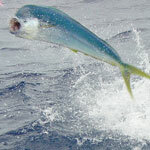 To land the biggest Dorado come in and June and July. 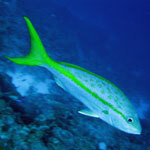 Dorado, Dolphin and Mahi-Mahi are all the same fish so don't let the different names fool you. To land one in Costa Rica will bring you home with a great story to tell. They are bright yellow, green, and blue. The average weight of them is 40 pounds and they can be up to 3 feet in length. These fellas can be upwards of 100 to 300 pounds and will certainly put your strength to the test. When you cross porpoises these Tuna will swim with them. We often use these fellas as bait for the big boys like Marlin but to get started with the Yellow Fine Tuna is always fun. 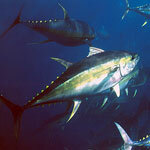 The best Tuna are found in Quepos, Los Suenos, and up and down the Pacific Coast. We promise a lot but even we can't promise these guys. 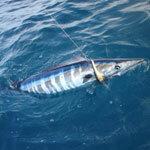 Wahoo are the rarest fish in Costa Rica. Wahoo can reach up to 180 pounds and be eight feet in length. They look similar to Barracudas and Mackeral. You must have steel leaders or they'll bite right through your line. It's not easy to catch one of these guys but if you do it'd be like hitting the lottery.. Good LUCK. These are one of the most sought after fish here in Costa Rica. They average 20-50 pounds but can weigh 100 pounds or more. Always here regardless of when you arrive but be prepared because they're not easy to land. Good fish to get started with on a day out to sea. Dozens of different types of Snapper here in Costa Rica so you won't get bored with catching the same type. They range from 20 to 75 pounds! Don't tell your captain we said this but you can catch them from the shore too and they're a tasty treat! If you choose to bring your own gear, that's great but bring the best you can find because we have seen far too many clients go home only with pieces remaining. Flies should be in the 4-13" size. We recommend tube flies and lots of sharp hooks. We have a very good supply of flies here as all our flies for Costa Rica are tied here in Costa Rica. For rods a good 8-10 wt for inshore fishing and a 10-12 wt for dorado and tuna. For sails, a 12-13 wt is great and of course for Marlin a big gun- 14-16 wt rod is highly recommended. 300-400 yds of backing on all these and a good supply of 40,60, and 80 lb leader tippet material is necessary. GOOD LUCK! Los Sueños Marina is one of the most exciting locations to go out and experience some real fishing. 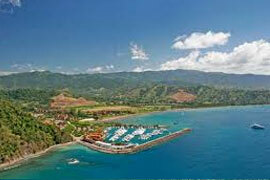 Los Sueños Marina takes pride in offering premiere hotels, condos, and mansions. For those who like to multitask, there is also a phenomenal 18 hole golf course and plenty of places you can enjoy fine cuisine. 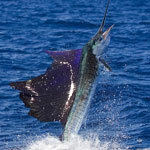 If you come anytime January through March, we guarantee you will be able to catch both Sailfish and Marlin. In the summer time by the Nicoya Peninsula, Tuna reigns king. The best is the variety in boat sizes. You can get anything from 26 ft pangs to 100 ft luxury yachts. 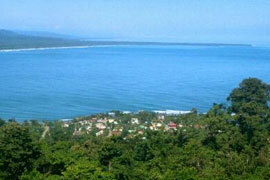 If you are staying in Jaco, this is one of the best options to consider because of its proximity. Quepos is very popular. Quepos Marina is comfortably located next to Manuel Antonio Park which offers everything from affordable hotels to luxury estates. Spring season undoubtedly entails Marlin, Snook, and Rooster fishing. Aside from its affordability and unbeatable prices, Bachelor Party Bay has some of the best relationships in town so you'll be in good hands. 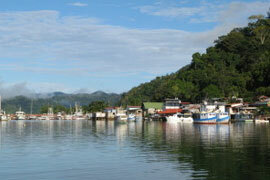 Quepos recently launched Marina Pez Vela which is highly accessible to load and unload. Snook fishing is heavy and it's more affordable then Los Suenos so it's pretty popular with our clients. Golfito is another great spot for fishing. The views are beautiful. 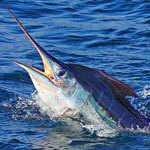 Marlin fishing is very prevalent. We have some of the best Captains who fish Golfito like it's the back of their hand so you'll be sure to catch some big ones. If you want to catch a Roosterfish Golfito is the place. Snapper are everywhere too so it's a great choice for big variety. More secluded with less congestion then Jaco so it's a great place if you want great fishing with peace and quiet. 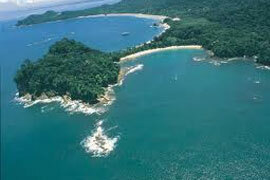 Drake Bay is near Corcavado National Park. Not too many captains tackle it, but everyone we send that way loves it. Drake Bay is an awesome location for someone looking for a change. It's truly rugged fishing. You're in the jungle, we recommend this for our more experienced fishermen. Inshore Rooster fishing rivals Golfito. Snapper and Billfish is also prevalent in Drake Bay. 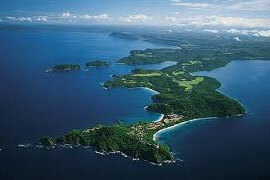 If you want a true natural Costa Rican experience, Drake Bay is for you. Marlin Marlin Marlin. Tamarindo is hot for Marlin for sure. You'll also find Billfish. Most people on a good day can pull in upwards of over half a dozen. Great place for both off shore and inshore fishing. 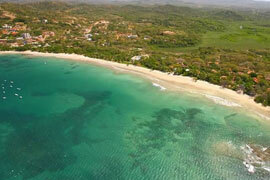 White Sandy beaches in Tamarindo make it a photo-shopped piece of paradise. If you're looking to go with your family and have picturesque beach views while fishing this is for you. Flamingo is AWESOME PERIOD. It's unique because it's best during December, February, and March. Roosterfish and Billfish are here. This is the best off-season fishing location. If you can't get enough fishing from Costa Rica and the fishing seasons aren't matching your visitation schedule we recommend you head to Flamingo. Papagayo is excellent from May through September. The best fishing for Marlin and Tuna is during that time frame. We recommend this for people traveling as a family because it's loaded with resorts. 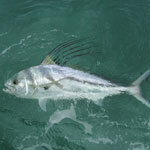 The roosterfish are in the north near Nicaragua. Not used by a lot of our clients, but it's a hidden gem. We recommend just one captain and his name is Eddie. If there are fish this guy knows where they are. There is some good Snook fishing on the Caribbean although primarily most of our customers do not head to that side of Costa Rica. 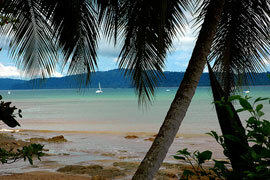 There are 2 or 3 lodges we use but mostly we send our clients to Tortugureo. Ask as about this one before jumping on it. It's for our more skilled fisherman.